This Safavieh Courtyard area rug adds a touch of modern flair to the design of any area in your home. Designed as an indoor/outdoor piece, its plush synthetic material will make you feel cozy and comfortable. Modern style and construction is combined in this machine-made rug. Bring this floral plants patterned green rug into your living spaces for a contemporary design aesthetic. Please note: The digital images and product dimensions on our website are as accurate as possible. Due to differences in computer monitors, some rug colours may vary slightly. Lengths and widths may vary from the published dimensions. We do our best to provide you with an exact measurement, but please be advised that some variation exists. Patterns may vary slightly according to shape and size selected. 2 ft. X 3 ft. 7 in. 60 day Manufacturer Warranty for defects only, for warranty information on this product, please call our Internet Customer Service Center at 1-800-628-0525. Normal wear and tear is not warranted. Modern and stylish, this Safavieh Courtyard area rug is a quality accent piece. Great quality is assured with this indoor/outdoor piece made out of plush synthetic material. Make a lasting style statement with this machine-made rug. This geometric patterned red rug makes a contemporary mark on your home's interior design. Interior design made simple with this contemporary Safavieh Courtyard area rug. Designed for your hallway, dining room, or living room, this indoor/outdoor piece made from plush synthetic material looks and feels great. The machine-made construction of this area rug is both modern and comfortable. Quality is assured with this geometric patterned beige tan rug. This modern Safavieh Courtyard area rug will instantly improve any room you place it in. Designed to decorate an indoor/outdoor space, this plush synthetic material rug is high quality. The machine-made construction of this rug makes it high-quality and durable. Add this geometric patterned brown rug to the dicor of your home for a contemporary infusion. Modern and stylish, this Safavieh Courtyard area rug is a quality accent piece. Keep the contemporary look in your home with this indoor/outdoor piece crafted from plush synthetic material. Bring this machine-made rug into your home for a durable interior design option. Modern style meets quality in this geometric patterned beige tan rug. 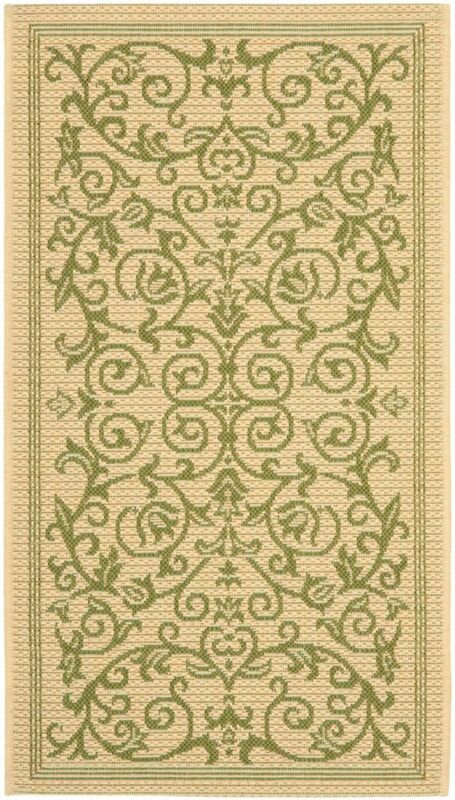 Courtyard Marc Natural / Olive 2 ft. x 3 ft. 7 inch Indoor/Outdoor Area Rug This Safavieh Courtyard area rug adds a touch of modern flair to the design of any area in your home. Designed as an indoor/outdoor piece, its plush synthetic material will make you feel cozy and comfortable. Modern style and construction is combined in this machine-made rug. Bring this floral plants patterned green rug into your living spaces for a contemporary design aesthetic.